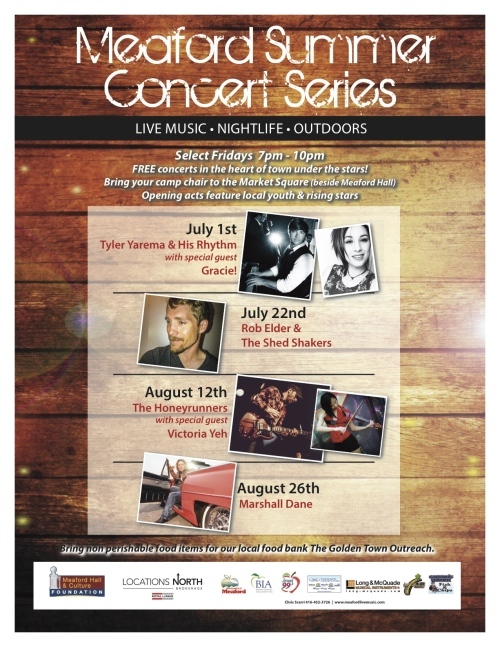 This summer, enjoy songs by the setting sun and under the stars, as Meaford’s Summer Concert Series comes to Market Square on select Friday evenings. The free concerts feature local young and rising stars, and kick off off at 7 p.m. till 10. Here’s what’s coming up. July 22, Rob Elder & The Shed Shakers, featuring some of Grey County’s best musicians playing a mix of originals and hits with a rocking, funky beat. Featuring special guest, Emma Page. August 12, The Honeyrunners featuring special guest Victoria Yeh This Toronto band plays feel-good rock fused with soul, and at this show they’re featuring one of Canada’s premier acoustic and electric violinists. August 26, Marshall Dane Country fuelled by rock and roll brings Marshall’s songs of hope, love and kindness home in a big way. Bring non-perishable food items to support Golden Town Outreach, and settle down in your campchair to enjoy the sounds. You can begin to enjoy the spirit of the season this weekend. On Saturday, from noon to 4 p.m., get some Christmas shopping done at the Meaford Farmer’s Market’s annual Christmas Market. More than 30 local artisans will have a huge variety of items on display at Meaford Hall. Gift ideas include beautiful handcrafted products and local produce, including children’s books, apples, honey and maple syrup, baking, fudge, preserves, knitted products, handmade teddy bears, doll’s clothing, jewellery, soaps, lotions, ceramics, wreaths, and much more. And a local musician will provide a suitable soundtrack for your shopping expedition. Then, on Sunday, enjoy the gift of music while helping to support a great cause. The Goldenaires, under musical director Jennifer Potter, present their annual Songs of the Season concert at the Meaford United Church, beginning at 2:30 p.m. The Goldenaires women’s choir was formed in 1969, and ever since they’ve used the concert to raise money for community projects. Enjoy a selection of contemporary and traditional holiday favourites, jazz pieces, and two special arrangements by A.G. “Bert” Hood – a selection that is certain to delight and set the scene for a festive holiday season. Tickets for the Songs of the Season concert are available at Stuff to Read or from choir members. Tickets are $12 for adults and $5 for children 12 and under. Billy and Ann Marie Fairley had found the perfect retirement location in Meaford – a beautiful, charming Ontario small town on Georgian Bay. But the couple weren’t retired yet, and beyond its location and charm, Meaford offered other advantages. Meaford also proved to be a welcoming environment for a small business, which met another criterion. Billy operates his tailoring business, The Sewing House, from the basement in their new home at 96 Margaret Street, where he tailors and repairs all kinds of clothing – dresses, jeans, jackets and more – including replacing zippers, which is a hard-to-find service. He quickly found customers knocking on his door, and his clientele continues to grow. To top it all off, Meaford’s musical community was a truly welcoming surprise for the accomplished rock drummer. “Music is becoming more than a sideline,” he says. “I’m busier here musically than I was down in Alliston.” From the foxtrots of Pitlochry to Meaford’s music scene, Billy “The Kid” Fairley has led an interesting and varied musical life. After three years in the hotel gig, he started a group called Just Us with Andy Roberts on guitar and Dougie Thompson on bass. (Dougie later joined Supertramp, and Andy played with a number of major artists on tour and in the studio, including a stint in the “Surrogate Band” during Pink Floyd’s 1981 The Wall tour.) Then he teamed up with an erstwhile folk trio gone folk-rock, becoming the drummer for String Driven Thing. 1973’s “The Machine that Cried”, the band’s first album recorded with the rock line-up, is “now regarded as a forgotten classic”, according to Wikipedia. When Billy maried Canadian Ann Marie and moved with her to Canada, he initially thought he’d left his musical life behind. “I lost all my musical buddies, and I lost a lot of chances.” He returned to the UK to play a few times, “But Canada’s a place to bring up your kids, definitely,” he says. And now his musical horizons are expanding in Meaford. He’s teamed with a number of professional and amateur musicians and songwriters and hopes to be in the studio recording soon. He also has plans to stage a revival of his musical, “Freedom”, a rock opera treatment of the Braveheart story brought to life in the movie starring Mel Gibson. “This is the true story, though”, Billy emphasizes. Canada Day kicks off in Meaford at 9 a.m. at Market Square, the parking area beside Meaford Hall. From 9 a.m. to 11 a.m., the Military Family Resource Centre will serve up the popular Canada Day breakfast of pancakes and sausages. Come early, so you’re ready for the flag raising ceremony and still have room for the Canada Day cake, at 11 a.m.
Activities continue on through the day, with a downtown yard sale, dog tricks for Beautiful Joe, a Library obstacle race, crafts and more. Beginning in the afternoon, enjoy live music from the Shane Cloutier band and Bored of Education. Then, as dusk falls, find a spot at the waterfront to take in the spectacular Meaford tradition of fireworks over Georgian Bay. Complete schedule of events in and around Meaford. Meaford, Bruce Grey Simcoe, and the Ontario government have released an ad which takes you on a night on the town. Warm gatherings, great food and exciting culture warm up this beautiful, snowy winter’s night. The video was shot at George’s on Main and Meaford Hall and Culture Centre in downtown Meaford. After 23 years in Meaford, you’d I’d’ve come across this Stompin’ Tom gem, but I only discovered it today. That’s the first verse of “Around the Bay and Back Again”, which appeared first on Tom’s 1969 LP, “On Tragedy Trail”. It must have been a favourite, because he released it again on “Stompin’ Tom Meets Big Joe Mufferraw” a year later. Here’s the legend performing the song in 1973, and again, nearly 40 years later, in 2010. Buy the song on Amazon. Sun and song… what could be better. Check out these outdoor music events coming up this summer. Next weekend, starting Friday, the King(s) come to Collingwood. The Collingwood Elvis Festival features lots of outdoor entertainment that will have you “all shook up”. Once you’ve recovered from the retro rockin’, you might just be ready for some avant-garde audio and art. Electric Eclectics comes to the Funny Farm on Scotch Mountain for the August long weekend. Two weeks after that on the third weekend in August, Summerfolk brings a real variety of sounds to Owen Sound’s Kelso Park. But you don’t need to wait for the festivals. Head down to the Meaford Farmer’s Market every Friday and you’ll likely catch a little live music along with the delicious 100-mile wares on display. And what could be better than seeing the sun set from Meaford Harbour while enjoying some great music? At 7 p.m. each Sunday till August 24, the Friends of the Library Summer Concert Series lets you do just that. Here’s a free event that fits right in with Culture Days this weekend – the 100 Mile Stomp. Head down to Meaford Harbour on Sunday, September 29, any time after 1 p.m., and enjoy entertainment, crafts, food and fun from local businesses. That local focus explains the 100 mile part. What about the “Stomp”. While the artists will perform a lot of their own music, at least 50 percent of the performance will be the songs of Stompin’ Tom Conners. It’s a tremendous Stompin’ Tom Tribute festival! Enjoy the music, buy CDs, crafts and other goods, and enjoy food from local merchants. Visit the 100 Mile Stomp website to learn more.